Eddie Gonzalez and Mike Ballardie agree to a three-year deal. 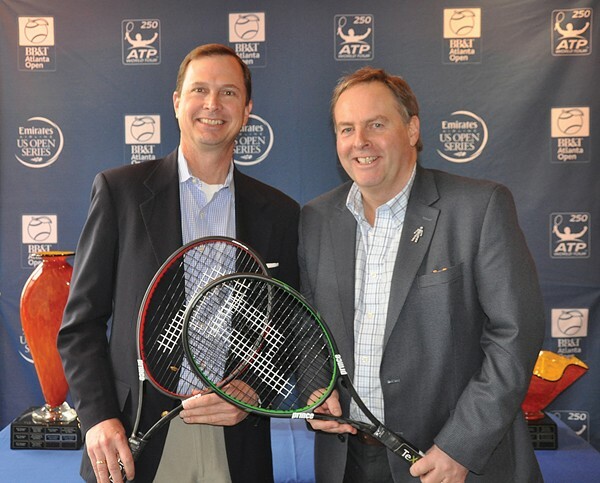 ATLANTA –The BB&T Atlanta Open, an ATP World Tour event with world-class players and Atlanta’s only professional tennis event, has announced a three-year sponsorship agreement with Prince® Global Sports to serve as presenting sponsor of the BB&T Atlanta Open Family Zone. As a centerpiece of the new Family Zone in Atlantic Station’s Central Park, Prince will lay down their new Prince Sport Court®. Additionally, Prince will be the tournament’s official racquet, string and grip and will provide the official string service at the event. The tournament will be held July 25-Aug. 2 at Atlantic Station. The BB&T Atlanta Open Family Zone presented by Prince is expected to draw thousands of participants throughout the entire tournament, and will give children and adults alike the opportunity to play tennis for free in a fun, family-friendly environment. Located in Atlantic Station’s Central Park, the Sport Court and accompanying attractions will be tentatively open for 69 hours over the tournament’s nine days.